The Israeli army continued it aggression and massive offensive against the civilians in the Gaza Strip, and bombarded on Thursday at night dozens of targets in the besieged coastal region killing three children and wounding several residents. 19 Palestinians have been killed since Wednesday evening, and at least 180 have been injured. 23 Palestinians have been killed since last Saturday; most of the casualties are civilians, children and women. 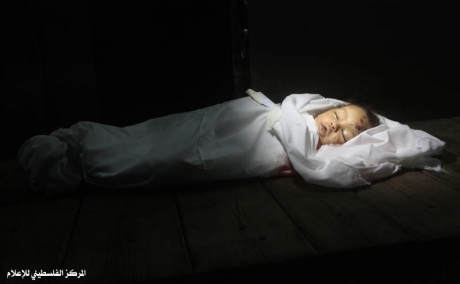 Ashraf al-Qodra, spokesperson of the Palestinian Ministry of Health in Gaza, reported that Israeli war jets fired a missile at a civilian car in Beit Hanoun, in northern Gaza, killing three children. The slain children were identified as Fares al-Basyouni, 9, and brothers Odai Jamal Nasser & Tareq Jamal Nasser, 16 & 14 respectivley. Earlier on Thursday evening, a 10-month-old infant, identified as Haneen Tafesh, died at the ash-Shifa Hospital in Gaza, after being seriously injured in an earlier Israeli attack. The Israeli army is widening its assault against the civilians in Gaza, bombarding their homes and lands. Israel killed 23 Palestinians in the coastal region since Saturday, 19 of whom were killed in the last 24 hours; among the casualties are 7 children, a pregnant women, and two elderly. More than 180 Palestinians have been injured; dozens are in serious conditions. Thousands of Palestinians held protests in different parts of the occupied West Bank denouncing the ongoing Israeli military aggression against Gaza. The army fired rounds of live ammunition, gas bombs, concussion grenades and rubber-coated metal bullets at them leading to a number of injuries. Clashes were reported in different parts of the Hebron district, in the southern part of the occupied West Bank, and the soldiers kidnapped three Palestinians. Injuries were reported in Jenin and Nablus, in the northern part of the West Bank during clashes with the army, a number of residents were kidnapped. The army also occupied a school in Jenin and turned it into a military base. Soldiers also invaded Beit Sahour and Beit Jala, in the West Bank district of Bethlehem, and clashed with local residents who hurled stones at the invading forces.